GamersFirst Café Claims : Making Moola, or just Making Mocha? I was reading an article on Massively a little earlier about GamersFirst’s new merchant site. My interest, hey, where are you going??? Sigh. OK, well I hope you come back once you’re done over there. Yay, you came back!! Right, where was I? Oh yes. My interest was piqued largely because GamersFirst is the publisher of Fallen Earth, which is quite good, and APB, which is also a game that exists. That, and the quite extraordinary claim that appears below. Well, that sounds good. I quite like money. Tell me more! Hmm. Those sound quite similar. 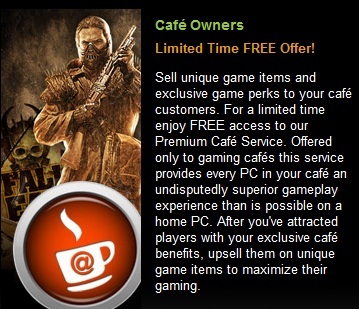 In both cases, you’re reselling in-game items, but method 2 requires you to own a café. Hold on. “this service provides every PC in your café an undisputedly superior gameplay experience than is possible on a home PC.”??? How wonderful!!! And this miracle can be achieved at no cost to your café (for a limited time). But what is stopping me from taking whatever is causing this superior gameplay, and using it on my home PC, bringing about a universe-threatening paradox loop? How is this free scheme creating undisputedly superior gameplay experiences, and why is nobody disputing it? I feel a dispute coming on, but first, lets try to figure out what this scheme actually does. Once you’ve signed up you will have access to our exclusive Premium Café Service as well as our entire catalog of game items and currencies at bulk purchasing prices. Premium Café Service gives your café a distinct edge over both your competition and home PCs. The most loyal and valuable players will be drawn to your cafe, and from there you can choose to sell them their favorite game items for maximum player value and cafe profits. All that is necessary to get started with Premium Cafe Service is a set of basic network details so we can connect your entire gaming cafe to our premium network. Since this this is an absolutely FREE service, there is nothing to pay. You simply need to set it and forget it. Your players will have the best gameplay experience possible at your cafe. You can use this to your advantage to attract more players and to also raise prices. You are free to choose how to include Premium Cafe Service in your business model. I see. So when you say “undisputedly superior gameplay experience than is possible on a home PC”, you just mean that the players might get a discount on your item shop. That’s not really what gamers are talking about when we talk about “Gameplay”. I believe you may be trying to confuse us by using buzzwords. In fact, that entire passage I quoted seems like an attempt to flimflam cybercafé owners into signing up for a service that is only free for a “limited time”, getting much-needed promotion for their stable of MMOs. Most of that stable, it might be said, should have been put out to pasture some time ago. This program is not going to allow you to sell customers their “favorite game items”, unless their favorite game items are inside GamersFirst games, which, when you put it like that, doesn’t really seem all that likely, does it? Unlike our competitors, we don’t enforce any price point restrictions on our merchants. You are free to price them as your market dictates without any outside interference. Well, that’s sure putting gamers first, GamersFirst. I don’t really trust the whole reseller part of the MMO market. It feels like an unnecessarily holdover from more traditional and material forms of trade. In an MMO, I already have a direct relationship with the manufacturer, so why would I want to buy through a middleman who would be extracting profit for themselves? More to the point, why does that make sense from the point of view of the MMO developer? I can see the benefit of selling cards in Walmart, so that relatives who are not internet savvy can get a present for their MMO-loving kin, but selling ingame items or subscriptions through a 3rd-party website seems utterly counterproductive to me. It is ALWAYS supercreepy to listen to discussions between middle-men, as it is we who are usually the commodity and resource being discussed. Regular folks aren’t really supposed to look at merchant sites like that, where being able to overcharge us without oversight is seen as a positive. We might also wonder why home owners are being promised an undisputedly inferior gameplay experience to the cafe folks. Fortunately, I don’t imagine that claim has any more actual truth to it than the one it logically follows from. Anyhows, there’s no deep meaning to this post. Marketing people write meaningless and deceptive guff that looks insane to anyone outside its intended audience. I just enjoy the irony of seeing it done by a company called “GamersFirst”. A website for Fallout Online has materialised, complete with the old time music that I always associate with the Fallout games. There’s no actual information about the game as yet; just a form for signing up to a mailing list and beta access, which I have duly filled out. The uncharitable might say that there already is an online version of Fallout, called Fallen Earth. There’s certainly a lot of similarities in the setting, even if the storyline is a bit different. Who would have expected there’d be more than one major MMO with a post-apocalyptic US setting? With the backing of Bethesda and Interplay, Fallout Online ought to have every chance of being the better game, but the tiny Icarus Studios has set the bar pretty high. I was a huge fan of Fallout and Fallout 2, though I skipped Fallout 3, mostly due to still being utterly irritated at the disappointment of Oblivion. I’m looking forward to seeing how Fallout Online pans out. Something to build a dream on? We’ll see. In the last few days I’ve been revisiting Fallen Earth. I tried the trial for a couple of days a few months ago, but didn’t really get into it. Having scored a free month from Massively, I’ve come back to give it another try, and I’m finding it more engaging than before. Maybe I’m just in more receptive mood, or it could be something to do with all the patches that have been applied in the meantime. I’m having fun. And so is my horse. Fallen Earth's version of Arkenor, with his trusty steed, Mintball. It’s a weird game, in a good way. Combat is First Person Shooter style, which makes it both exciting, and usually quite short, one way or the other. If, like me, you’re not actually terribly good at FPS any more then this might give you some problems, but I’m slowly getting the hang of it again. Being a bit rubbish at combat is not necessarily a problem anyway, as you gain xp for harvesting and crafting. Not just crafting xp that only makes you better at baking cakes. The real stuff. Technically you could hit the level cap without very much combat at all, though harvesting ingredients does lead to the occasional unpleasantness with the local mutated fauna and flora, so you’d want to at least have some rudimentary combat skills. Crafting seems quite deep, with just about everything in the game being craftable, and so many different ingredients that my bank is set to burst. To my joy, the only thing that stops me from working every craft is time, as unlike the other skills, crafting skills improve through use rather than needing points put in them. To craft an item can take a significant amount of time, but you don’t have to stand about waiting. You just set it off, and go about your business. You can queue up to 20 crafting jobs that will trigger in order, providing you have the ingredients in your inventory. How I am managing to bake and sew while riding about shooting things I am unsure, but it beats having to watch a progress bar. You continue to work through your crafting queue when you’re offline, which is particularly handy for lengthy jobs, like the parts I am putting together for building my All Terrain Vehicle. At the moment most crafting jobs takes between 1 and 10 minutes, but I think that will increase as I move to higher level items. The game engine is smooth and pleasant, and the UI is responsive. Inevitably, given the setting, the colour palette tends towards earth tones, with very few bright colours. It’s a dirty, rusty, decaying sort of world, but perhaps if mankind can learn its lessons it will bloom again. It’s also a big world with, so far as I’ve seen, no instant travel. You receive a basic horse early on in your career, which makes this a lot less painful. 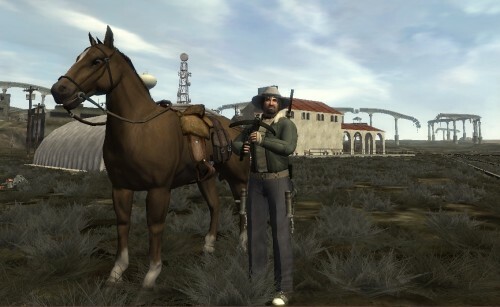 Later you can get faster horses, and a variety of mechanical vehicles. At the moment that is quite sufficient for me, though I will be interested to see exactly how long it takes to get from the furthest high level reaches of the game world back to Sector One. Maybe we could try to get the old train lines working again. This week there was a major patch called Blood Sports. The main feature is a sort of PvP arena that you can pop in and out of as desired. I haven’t tried it yet, mostly because I suspect it would involve a lot of me being punished for being under-equipped. I’ll check it out when I feel a little less like a puny newbie. In addition, the level cap has risen from 45 to 50, and a new world area has been opened up to support that. That obviously doesn’t affect me too much either yet. There have also been a whole swathe of skill rebalancings, which probably do affect me, but I hadn’t had time to get to used to how they were before, so I probably won’t notice. The Fallen Earth 1.4 patch notes can be read in full after the jump. If you fancy checking this rather unique MMO out, there is a ten day trial available over on the official website.